Bengaluru: India’s top online retailers Flipkart Ltd and Amazon India Ltd continue to be the most popular online shopping destinations with consumers, with Flipkart having a clear advantage in tier-II and tier-III cities and towns and Amazon having a big edge in metro cities, according to the latest RedSeer E-tailing Leadership Index (ELI). While Flipkart and Amazon (Amazon Seller Services Pvt Ltd) continue to dominate the e-commerce rankings, both firms saw a slight decline in their overall scores. 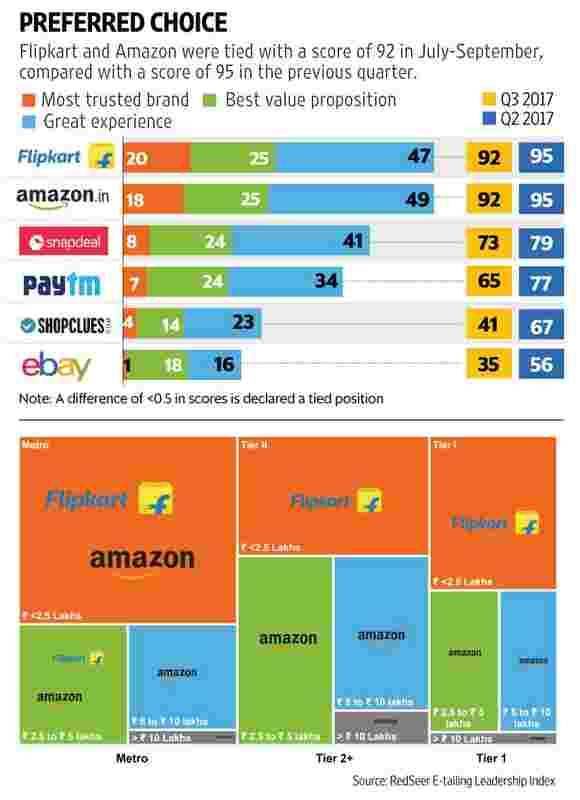 Flipkart and Amazon were tied with a score of 92 for the July-September period, according to the latest ELI report, compared with a score of 95 in the previous quarter. While RedSeer did not give a specific reason for the fall in scores, the July-September period coincided with the flagship festive sale events for both Flipkart and Amazon India. Scores typically fluctuate during festive periods, owing to a much bigger volume of orders and returns, which typically impact metrics such as customer satisfaction. Other top retailers such as ShopClues, Paytm Mall, Snapdeal and eBay India also witnessed a sharp decline in their overall scores during the period. Snapdeal’s ratings fell by six points to 73, while Paytm Mall also saw a 12-point decline in its score, coming in at 65. Paytm Mall took a hit on metrics such as brand recall and customer satisfaction. ShopClues and eBay India, which was acquired by Flipkart in April, brought up the rear, with scores of 41 and 35, respectively. In a surprise, Snapdeal held on to its place in the index despite being forced to cut costs and conserve cash after a sale to Flipkart fell apart in August. RedSeer said some consumers still recall the company as a major online shopping destination given that in most of the past five years Snapdeal spent heavily on marketing. The latest report from RedSeer has also adopted a different methodology to create the rankings. Unlike earlier reports, RedSeer has adjusted the sample size of its respondents to represent the actual online shopping population. What that means is that the study has focused more on active e-commerce consumers who shop online on a regular basis. For the latest study, RedSeer surveyed 7,500 online shoppers in 30 cities from July to September, tracking prices of various items across India’s top five e-commerce firms, which include Paytm Mall and ShopClues. RedSeer said it analysed at least 30 different parameters to arrive at the rankings. Flipkart and Amazon India did not respond to requests for comment. During July-September, Flipkart consolidated its position at the top of Indian e-commerce, with a dominant performance during its Big Billion Day sale against Amazon India in September. Flipkart’s comfortable festive season victory came as a surprise to many analysts who had expected Amazon India to further narrow the gap with the local e-commerce giant. According to the report, Amazon currently holds a significant edge over Flipkart in tier-1 and metro cities. That, according to experts, has plenty to do with Amazon’s hugely popular subscription programme Prime. Prime has been a cornerstone of Amazon India’s performance over the last three-four quarters. The service has also vastly helped improve perception of delivery experience, despite only a slightly superior performance against Flipkart. Mint first reported on 14 April that the Amazon Prime membership programme has become an important lever for the company in its battle against Flipkart, accounting for nearly 30% of all orders on Amazon India. Flipkart, taking a leaf out of Amazon’s playbook, is also expected to relaunch a revamped subscription service for customers, as Mint reported on 18 October. However, when it comes to tier-II and tier-III cities, Flipkart has a clear advantage over Amazon India, according to the ELI report. According to executives at both companies, the battle between Flipkart and Amazon is unlikely to conclude anytime soon, given that the two rivals are extremely well-funded and are investing heavily in their respective businesses. Over the past four years, Amazon has invested aggressively in India, committing to spend $5 billion to grow its business in the country. Mint reported earlier in November that Amazon India has nearly doubled its authorized capital to Rs31,000 crore ($4.74 billion), improving the prospect of further investment commitments from Amazon founder and chief executive Jeff Bezos. Since launching its Indian operations in 2013, Amazon has invested at least four times in its Indian marketplace—a Rs2,010 crore infusion in December last year, a Rs1,680 crore investment in June, a further Rs1,620 crore infusion in October and a Rs2,900-crore investment earlier in November. “I think our investments are still squarely in the same three areas—how do we add more selection, how do we make it easier for sellers to offer more competitive prices and how do we build for faster deliveries. I don’t think we do anything else," said Amazon India chief Amit Agarwal in a recent interview with Mint. “A layer on top of that is that we keep investing in Prime—so video, music, Echo, etc. are our key areas." Flipkart also boosted its ability to take on Amazon India by raising a mammoth round of funding from SoftBank’s Vision Fund. Flipkart said it has more than $4 billion in cash after the SoftBank round, which comprised a capital infusion of $1.4 billion and another $1.2-1.4 billion of secondary share purchases.